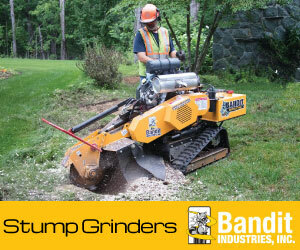 Bandit Industries, Inc. manufactures a variety of large equipment such as wood chippers, stump grinders, and skid steers. Contact Iron Source to learn more about buying or renting Bandit equipment. Every Bandit machine is built by specialized teams utilizing state-of-the-art manufacturing technology, traditional hand-assembly, and extensive welded construction. All equipment is built according to customer specifications with the highest quality and craftsmanship. If you don’t see exactly what you need, talk to a Bandit representative about custom builds. We’re happy to build the exact machine to fit your needs. Bandit has been leading the industry in wood chippers since the very beginning in 1983 in Mt. Pleasant, Michigan. With nothing more than a few ideas and a commitment to building quality machines and provide the best customer support possible. Over thirty years later, Bandit is still committed to providing the best possible service and the highest performing machines in the industry. Now, the company offers a variety of products including the best wood chippers in the business, stump grinders, shredders and rock crushers, and track carriers for land clearing. We recommend Bandit products whenever you have land to clear. With a variety of wood chipper sizes, they have something to handle every job site from one tree to hundreds of acres. As a certified dealer of Bandit products, you buy and rent Bandit equipment from Iron Source in Georgetown or Smyrna. We can also service any Bandit machine through our Parts and Service department. Just give us a call. We hold ourselves to the highest integrity and ethical behavior and deliver what we promise. We strengthen our reputation through trust. Our dealers, customers, suppliers, community and employees must be able to trust what we say and be confident that we will keep our commitments. Bandit’s dedication to quality, performance and customer support is what differentiates us from the competition. It is our employees personal pride and customer focus that continuously drives us to improve our processes and the products and services we provide. Our continued success depends upon addressing the needs of our employees and exceeding the expectations of our dealers and customers. Bandit’s diverse set of talents, thinking and opinions is what makes our team strong. We respect and value differences in opinions, experiences and backgrounds. We know that only by working together, we can we produce better results than any one of us can achieve on our own. We make meaningful commitments to each other and those with whom we work and serve. We are committed to providing a safe, personally satisfying work environment for our employees. The commitment we share is essential to meet the needs of our dealers and customers. It is our duty to carry forward the Bandit legacy.